Vietnamese tourists and Egyptian guide among fatalities. A bomb attack on a sightseeing bus near Egypt’s famed pyramids killed at least four people and wounded 12 others on Friday, as attackers struck a target near the heart of the country’s struggling tourist industry. Egypt’s security forces provide assistance to tourist convoys, but Prime Minister Mostafa Madbouly said the bus deviated from a designated route without notifying authorities. 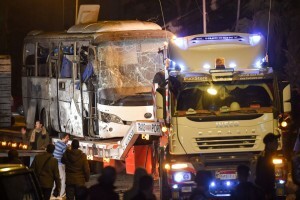 Egyptian officials said the bus was hit by a hidden roadside bomb at approximately 6:15 p.m. local time. The dead included three Vietnamese tourists and an Egyptian guide. No group immediately claimed responsibility for the attack. The country’s security forces are combating an active Islamic State insurgency in the Sinai Peninsula, several hundreds of kilometers east of Cairo. Those militants have staged a series of attacks in recent years that have included targeting tourists. In 2015, the group claimed responsibility for a bomb attack that brought down a Russian passenger-jet over Sinai, killing all 224 people aboard. Why Not A Three-State Solution?